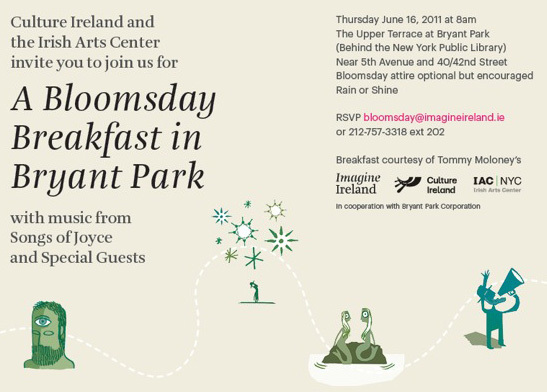 This Thursday, celebrate the legacy of Irish author James Joyce, and his novel Ulysses with a garden party in the park. Festivities will recreate the opening scene of the book with a complementary Irish breakfast, musical performances by Songs of Joyce, readings from Ulysses, and more. Each year, Bloomsday is observed around the world on the same day as the novel takes place. So if you're in the Bloomsday spirit, we encourage you to dress as Leopold Bloom might have on June 16, 1904 in Edwardian vintage attire. The event is free, courtesy of Imagine Ireland and the Irish Arts Center, but if you're planning to attend, please RSVP to bloomsday@imagineireland.ie or 212-757-3318, ext. 202.